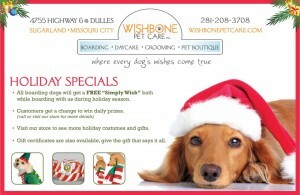 Join Wishbone Pet Care in celebrating the holidays! They are offering great specials and a gift certificate to their new facility would be the perfect gift for the pet love on your list. And, if you still need holiday boarding reservations, give them a call! They are conveniently located in Sugar Land/Missouri City and they have a great retail area for stocking stuffers.